Ever since we signed up to run the Dark Side Challenge late in the summer of 2015 I wanted to dress up as R2-D2 and Darth Vader. BUT, in December 2015, The Force Awakens premiered… since then I have had a slight obsession with BB-8. I instantly knew that I must dress as her (I stand by the galactic truth that she is a girl) and thus I decided I would have Mike dress as R2-D2. He easily obliged (I think he secretly loves cos-running). As you know from Mike’s first adventure into cosrunning, for him it basically has to be all running clothes, easy enough. Since April is warm in Florida I both knew we were definitely going to need tank tops. 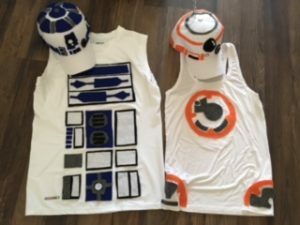 I decided since both droids are, for the majority, white I would make both of our costumes out of white hats and white tank tops. I gave Mike the liberty of choosing his own bottoms. 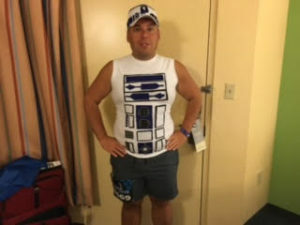 For myself I chose to re-wear my white compression shorts and tank top that I had used when I dressed as Olaf for the 2015 Walt Disney World Half Marathon during the Dopey Challenge. 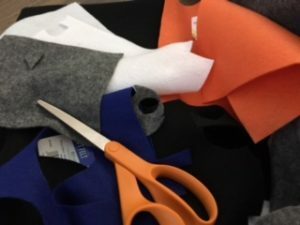 Once I had hats and tank tops in hand I decided that the best way to make the costumes would be with felt and hot glue (my go-to for making running costumes). I decided that I would make both hats first for our costumes. I headed to Pinterest for ideas for both hats, but unfortunately I did not have as much luck as I hoped. So I went on a Google search next for pictures showing both droids from all directions. From there I free-handed everything. 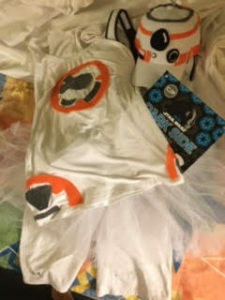 For BB-8 I focused on the small ball on the top of her head for the design that I tried to duplicate. Starting on the front of the hat I began with the large black circle, small black circle and small white circle. These circles included multiple layers of white and grey with them. Along the brim of the hat I cut out different sizes of orange squares/rectangles with a few black and white squares. Then I made a large orange ring around the top followed by a grey ring. I did use canisters to come up with perfect rings for the these layers. I topped the hat off with silver pipe cleaners to create antennae. I used hot glue to attach the felt to the hat. With R2-D2 I used the semi-circle on the top of his head to use for my hat design. For his front I cut out a blue square with smaller rectangles to place behind it then a black circle with two smaller white circles on top of that. I also cut out two more blue circles with a grey circle in between them that would create the other circle that is on his front. 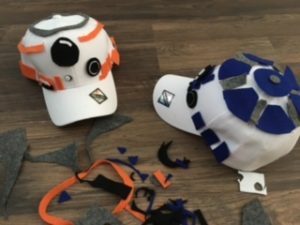 For the elements along the bottom of the hat I followed the same process as I had with BB-8 for cutting out blue, black, grey, and white rectangles/squares. For the top of the hat I used my canisters once again to create a large blue circle to place on the top and added in grey rectangles placed around the circle and a grey circle to place on top. Then I cut the blue circle up so that it would evenly space around the top of the hat in 6 even pieces with the grey strips between them and still leave white showing. Time to move on to the tank tops. For BB-8 I cut three orange rings with the notches in them. If you remember back to elementary school when you made snowflakes I used the same idea to do these by folding a circle in half then in half again. It took a couple of tries till I got them looking exactly how I wanted them. I placed one on the front and one on the back of the shirt. I cut the third ring in half and put them on the bottom sides of the shirt. For the next step I looked at four different rings on BB-8 to see what the inside of them looked like then mimicked those designs by cutting out those shapes in grey. 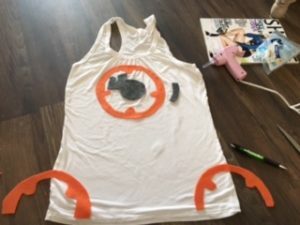 Lastly I hot glued everything on the shirt, and just like that BB-8 was completed. 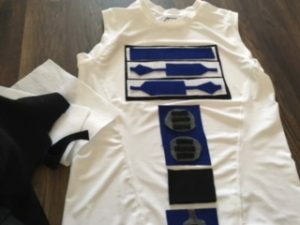 For R2-D2 I looked directly at the front of him and began cutting out lots and lots of blue, white, black, and grey squares. For the upper third of the shirt I used a half a piece of 8.5×11 black felt to measure almost everything off of. Then I added three white strips on that black piece of felt followed by placing the blue designs on tops of the white strips. The middle third of the shirt I measured the two larger rectangles and made them the same length as the upper third. The same was true for the bottom third of the designs. 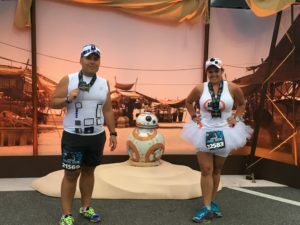 We were now officially ready to head to Walt Disney World to run in costume for the Star Wars Dark Side 10K. The day was finally here, time for the Star Wars Dark Side 10K! I laid out my costume the night before just so I knew where everything was so there was no rush in the morning. RunDisney already has you getting to the race early, but I wanted to get there even earlier for photo ops. I got dressed quickly and was ready to go, no extra time necessary to get ready in this costume (which is more than we can say for Jake’s somewhat more elaborate costume!). 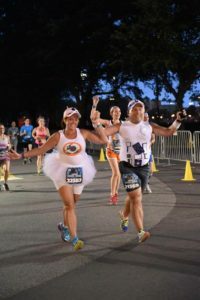 A quick tip for those of you that haven’t run in a tutu before: the best place to put your bib is on your tutu, makes for going to the bathroom much easier. Once we arrived to the pre-race party we quickly got in line for a photo op with Boba-Fett who was the first character and we figured we would work our way from there down the line to the characters. Unfortunately, after our picture with Boba-Fett, they announced the characters were going away and would be out at the finish line, I was very disappointed. We were able to get a quick pic with Jabba the Hut though because he was basically a set piece. It was a very hot morning, but I felt we were appropriately dressed for the temperatures. Mike and I stuck together throughout the race so we were able to get pics of us in our matching costumes. R2-D2 ended up being the first stop along the course, but the line had already created quite a long one and we decided to skip it. It ended up working out well, but as we noticed throughout the pics, Mike slowly lost pieces of his costume. Our only guess is that Mike tends to sweat quite a bit when he runs and his body heat reactivated the hot glue on his shirt, which made pieces fall off. In the future for hot races I may have to take to sewing his costumes (thank-you Grandma and Aunt Ralph for all those sewing lessons). I also learned for myself that, even though I have a hat on, I should still wear a sweaty band underneath it to help keep the sweat from dripping down my face. We all have our own motivations for running, but most of us do it because it’s fun. And running in costume only adds to the fun. Hopefully, this article has given you some ideas for your next CosRunning adventure. You can also check out our picture gallery of race costumes on our Facebook page. 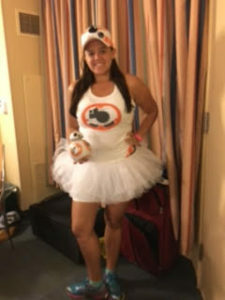 If you are looking for ways to add more character to your Casual Running adventures, consider running races in Costumes. 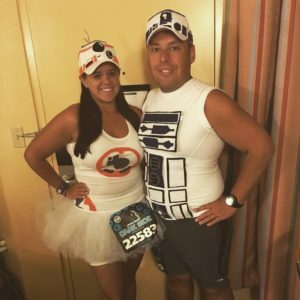 Jake and other members of the Casual Runner Team will be bringing you more great features with costuming ideas – including how they bring their great concepts to life – that are both awesome-looking and runner-friendly. The Casual Runner Team wants to hear from you. If you have any questions about anything we cover here on Casual Runner, if you have any questions regarding running gear or training for your own Casual Running needs, or if there is anything that you would like us to cover on Casual Runner, please leave a comment or email us using the links below. To ensure that you do not miss all of the great content from Casual Runner, please be sure to like us on Facebook, follow us on Twitter, Pinterest, and Instagram, subscribe to our YouTube channel, and add us to your circle on Google+. Neither the author nor Casual Runner received any compensation for reviews listed. The product reviews herein were provided by the manufacturer and/or purchased at retail price for purposes of this review and the opinions are solely those of the author. Copyright © 2019 The Casual Runner.